Just something quick I came up with. awe, she drooled on it. This is so cute. I love the expressions and colors. This is soooo cute!!!! 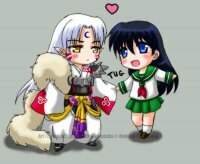 Kagome is most likely thinking "FLUFFY!!!" LOL at Sesshoumaru's look. xDD Beautiful art! !